Congratulations To Our Week 2 Winners! Thanks to One-Eyed Jack for the game codes! 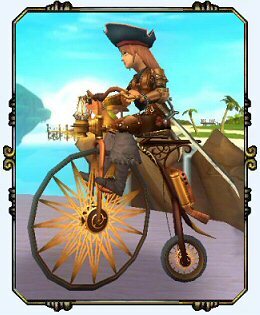 Today’s winners will receive a game code that provides a Permanent Pennyfarthing Mount and 2,500 Crowns. I hope our winners will send us a picture of their Pirates and their mount! We would love to share them here on the Portal and help you celebrate! Tell Us A Story Contest! This weeks contest was a creative one. We wanted you to tell us a short story about your favorite Pirate101 Pirate Character. That’s one of the pirates you created to play the game. Your story could be about where your pirate grew up, how they meet their first mate, an adventure they shared with their crew or games they like to play with their pet. What ever you’d like it to be. Make if entertaining and have fun with your story. It can be scary, adventurous, an entry in your Captain’s Log or just plain funny! And boy did we receive some great stories! 32 in all and each one was pretty great. But we had to pick two. We sectioned out our favorite stores, and cut the entries to 28. Still a lot to choose from. So we went through them again and cut the entries to 14. This was really really hard. So we decided to randomly pick two entries from the 14. We picked story 6 and 14. It all began when I was trapped, lost and alone. My parents, I’ve heard, got captured by the Armada and sent down to the depths of despair. Sadly to this news, my insides swelled. I thought to myself: I can’t cry. I’m the daughter of the sneakiest swashbuckler known to live in Skull Island. I can’t let myself off guard.Immediately, when their will was found, I was sent to Mooshu to fulfill my father’s wish. He understood the dangers from training with the best assassins in the world, but he trusted me wholeheartedly. Father had mentioned I should find his ally, Sui Ming, the most vicious assassin.Hidden in an abandoned hut, at the sight of Sui Ming, I had to prove my worthiness. I felt sinister with my sharp blade. Especially when I was hidden in the shadows and had distributed numerous sneak attacks. He accepted me in, and praised how much I had resembled my father. Over the years as I’ve grown stronger and have controlled my speed. When Sui Ming told me I’ve learned all I could, I sailed back to Skull Island where I trespassed onto Armada grounds and locked up in their dungeon. I was raised in Grizzleheim by a tribe of Bears, my parents were lost in a storm, and the armada arrested me for assaulting an armada officer while trying to defending my best friend’s honor. I was imprisoned in an armada ship when all of a sudden I heard a blast. And a really clumsy pirate dress like Santa Cluss and a monkey with polarian accent rescued me. Forward after I found Subbodai.We got in the ship’s deck and there we found Deacon, he called his battle angels (armadas elite warriors) so we fought but with the help of Subbodai, we defeated them. But Deacon had a card up he’s sleeve then all of a sudden some big like clockworks things appeared but were blasted with cannons, so Deacon Fled the scene but not before blasting Boochbeard. We escaped to Boochbeard’s gallon and he taught me how to navigate, and told me not to get into broad side combat. But I stilled sink one armada ship and then we headed to skull Island where I meet captain Avery. 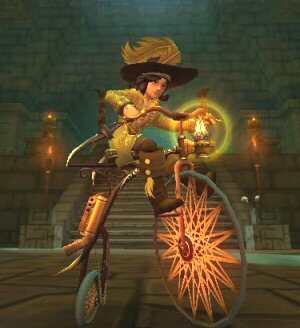 Join us next week when we give away two Game Code for our (Grand Prize) Black Rain Shades, Pennyfarthing Permanent Mount + 10,000 Crowns (NOTE, the Black Rain Shades is a level 50 item that cannot be stitched)! Our contest will be a week long and will be drawn on Friday. This entry was posted on July 26, 2013, in News and tagged 2, code, contest, game, pirate, Pirate101, week, winners. Bookmark the permalink.